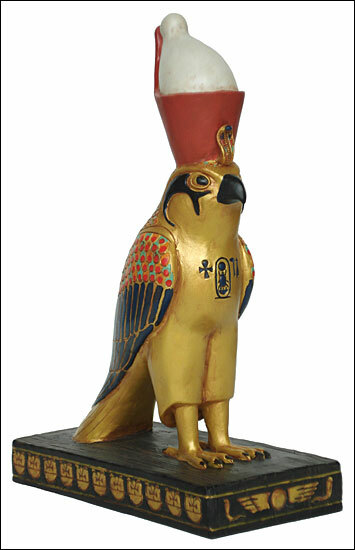 Horus falcon, horus, god horus, falcon, egyptian statues, egyptian gods, egyptian reproductions. In Egyptian mythology, the falcon was the animal that symbolized and represented the god Horus. Horus was the Divine Child of Osiris and Isis. As the Incarnate God, his roles were numerous. He united the cosmic principles of male and female. He acted as the uniting force between Upper and Lower Egypt. He interceded on behalf of the King to the Gods and as a living God, it is Horus who bestowed supreme power and divine kingship to a Pharaoh. From his union with Isis he has four sons, guardians of the four Canopic Jars that contain the visceras of the embalmed deceased. Horus most important cult centers were at Edfu, where the God was venerated in the image of the winged disk, at Kom Ombo, where as Son of Ra he bore the name Haroeris, and at Heliopolis where he was regarded as the God of the Morning Sun under the name of Ra-Harakhty.